The decision of the British people in a referendum on 23 June (2016) to leave the European Union (EU) — known as ‘Brexit’ — promises to emerge as a most profound event in the nation’s recent history. The result of the referendum in favour of Brexit, by a majority of 52% against 48%, was decisive yet not by a large margin; moreover, the striking differences in voting patterns between England and Scotland, and even within England, between London and other parts of the country, invoke deep tensions (In Scotland and London the Remain camp had a clear majority). The effects of Brexit are still very early to call and are hard to predict because a departure of a member country, let alone the United Kingdom, from the EU has never been experienced so far. The effects also are expected to impact multiple areas, including politics, economics, business, social welfare and standard-of-living. This article focuses on the area of retailing; it reviews and contemplates early assessments of the plausible effects that leaving the EU can have on retailers and consumers in Britain. However, due to the early stage of the process, the ambiguity that surrounds the implications of leaving the EU, and the fact that the new British government is not enacting yet an exit from the EU (i.e., Article 50 of the EU Lisbon Treaty), one should be cautious in taking these assessments as concrete predictions about the (probable) outcomes of Brexit. Uncertainty mixed with pessimism has claimed an immediate toll on the value of the pound sterling (particularly its exchange rate against the US dollar); stock prices have also moderately declined in London Stock Exchange, but further declines are foreseen as the process unfolds. The devaluation of the British pound is a critical factor whose effect is expected to roll for several more years. Retailers are concerned that rising prices of imported goods (e.g., food, clothing) will deter consumers. In addition, increased cost of imported raw materials and components used in production is likely to contribute to rising prices of local goods, further exerting an inflationary pressure. Positive effects that may arise from this devaluation on exports will be discussed later. The sense of “bad news” is not escaping consumers either, manifested in a quick and rather sharp decline in consumer confidence as reported by GfK marketing research firm. This could mean that consumers become hesitant and more inclined to “wait and see”, thus postponing their more costly purchases, particularly of discretionary and leisure products and services. The Centre for Retail Research (CRR) considers multiple aspects wherein retailers and consumers are likely to be affected while entering a post-Brexit era. It is suggested that a decline of 5% in the value of the pound against the euro would be enough to compensate for new tariff barriers imposed by the EU, and the steeper decline that already occurred is a very good thing — it would help exports (e.g., e-commerce), transitioning from imports to local production, and tourism. The CRR argues that the pound was already over-priced and needed correction (note that right after the referendum the pound declined 8% against the dollar and euro, but a slide down occurred earlier, at the beginning of this year, so against values of late 2015 the pound declined by as much as 15%). But there are additional important factors with structural implications that are noteworthy: need to fulfill changing jobs and a drive for automation; need for new worker and consumer protection laws and regulations; re-settling (digital) data protection regulation and mechanisms. There is broad agreement that in order for Britain to retain relations with the European Single Market, it will have to continue and abide to product and data protection standards of the EU. Britain will also not be able to completely restrict worker migration from the EU. The difference will be, however, that Britain will have to work by those rules but will not have a say about them — a warning the Remain campaigners continue to critically voice. 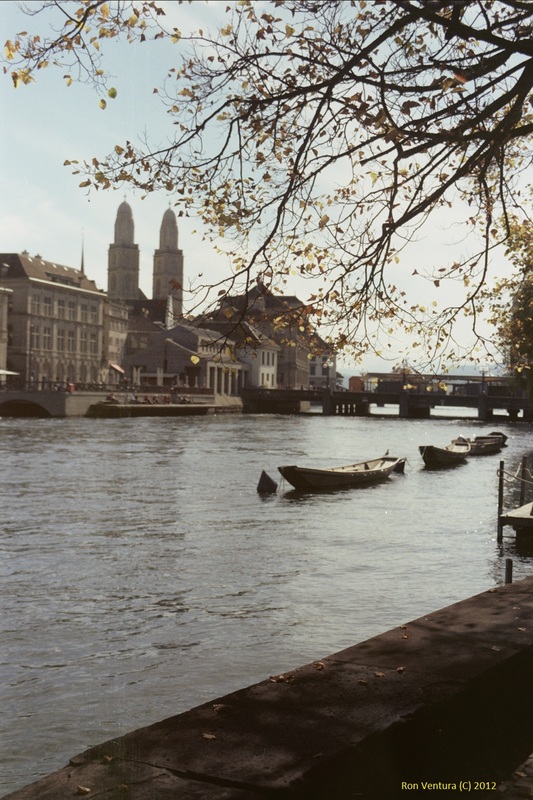 Different models are contemplated for the relations of Britain with the EU in the post-Brexit era, notably by joining Norway in the European Economic Area (EEA) or replicating the special relations of Switzerland with the EU. But the EU council nervously hurried to warn Britain, or any other country that contemplates to follow, that it should not allude itself of receiving an advantageous status as of Switzerland’s. Another avenue for resolution may consider the trade arrangements of Israel as a non-member country with the EU, and its participation in Horizon 2020, a programme for science and technology research and development. References made in the media to changes in retail sales in June seem too soon and hardly indicative of a real effect of the Brexit decision, primarily given that only ten days remained to the end of the month after the referendum (some sources suggest waiting for July’s figures). Figures also vary, depending on the basis of comparison (e.g., volume or value, last month or same month last year, all or like-for-like [same stores]). For example, sales by volume decreased 0.9% in June compared with May (2016), yet compared with June of last year (2015) they increased 4.3% (by value, sales increased just 1.5% [Britain’s Office for National Statistics (ONS): Retail Industry-Sales Index]). Different figures were published by KPMG consulting firm together with the British Retail Consortium (BRC): Their Retail Sales Monitor shows that sales grew just 0.2% in June year-on-year, but when compared on a like-for-like basis they dropped 0.5%. The BRC-KPMG monitor furthermore indicates that non-food sectors, especially fashion, were hit harder than the food or grocery sector. Recent observed changes may be attributed at most to so-called ‘Brexit-sentiment’ . If we were to look already for a more reliable indication of an immediate post-referendum shock, the KPMG’s press release reports that sales fell particularly in the last week of June. The Financial Times (13 July ’16) indicates that according to its Brexit Barometer, day-to-day spending “may have bounced back to just slightly below what it was immediately before the June 23 referendum”. The number of visits to stores (‘footfall’) declined in the week immediately after the referendum (10% year-on-year for weekdays – especially on High Street), recovered a little in early July, followed by another a drop in visits. The fluctuations are not consistent and it is hard to conclude a trend at this time. The picture for Saturdays is even less bright: “high-street footfall on Saturdays, the most important shopping day, has now fallen year-on-year for three consecutive weeks”. The Economist Intelligence Unit published just before the referendum a special, rather negative, report on Brexit (“Out and Down: Mapping the Impact of Brexit”). It relates to key implications of Brexit in regard to retailing: a fall of the pound, inflation in line with rise of import prices, consumer purchasing hesitation, and more complex supply chains for retailers. According to their projection, the year 2017 will be the worst for retailing; recovery will be felt during 2018-2020 as growth of retail sales volume resumes, but it will happen intermittently and sales will not return to the pre-Brexit level. In order to better grasp how Brexit may change the direction for British economy, and for the well-being of consumers and retailers in particular, it would help to take a little longer look backwards (i.e., as far as 2007) at retail sales and some additional indicators. The ONS Retail Sales Index by volume (seasonally adjusted, excluding fuel): After a long period, from 2006 (shortly before the financial crisis) until late 2013, when sales volume (index) was almost stagnant at just about 100, it started lifting since early 2014 and until June this year (2016) to a level of 112.5. It has been a positive sign for return to the expansion years of a previous decade (~1996-2006). But the implementation of Brexit (i.e., at least while negotiating new trade agreements) threatens to halt the climb and impede a continued recovery of the sector from the lingering effects of the financial and economic crisis of 2007-2008 (including a ‘second spell’ in 2011-2013). Growth in pay compared with inflation (ONS: UK Perspectives 2016 Personal & Househod Finances [Section 4]): This is an indicator of the cost of living (or the purchasing power of income from work). We may notice three distinct periods: (a) A ‘shock’ response to the financial crisis ~2008-2009 included a steep rise in consumer prices while growth in regular pay dissipated, and then a ‘correction’ of slowing price increases; (b) Inflation rate higher than growth in pay ~2010-2013 — during this period of the hardest burden on consumers, growth in pay remained at a bottom level of 1-2% while inflation climbed as high as 5% (2011) and subsequently “cooled” to 2-3%; (c) Renewal of real rise in pay ~2014-2016 as inflation starts to subdue, falling to near 0%, and pay growth reaches 2-3%. Worsening market conditions due to Brexit could lead to erosion once again of regular (weekly) pay and suppressed consumer spending. Household spending (ONS: UK Perspectives 2016 as above [Section 5]): The average household expenditure, inflation-adjusted, decreased from 2006 through 2012 from ~£550 to about £510 per week; then spending started to recuperate in 2013 and 2014, reaching £530. Improvement may have continued up to this year: On the one hand, regular pay increased in real terms in the past two years; on the other hand, the real disposable household income in Britain has been hovering just above £17,000 since 2006 (after a climb in previous years), though lifting its head a little in 2015. Now there is higher risk that such improvement in spending will not be possible to continue. Consumer Confidence Index (GfK): The research firm GfK conducted a one-off special survey in the week following the referendum to measure its Consumer Confidence Barometer (CCB) (normally updated on a monthly basis). It provides a sharp demonstration of the impact of ‘Brexit-sentiment’: The (net) index value dropped from -1 in the previous survey to -9 after learning of the referendum result. The last time a similar decline (8 points) in a single month was measured occurred in 2011, and only in 1994 had a larger single drop been measured. Those belonging in the Remain camp are more negative (-13) than those in the Leave camp (-5). Respondents to the barometer are asked about the current state of the economy and their expectations over the next twelve (12) months — 60% expect the economic situation to worsen (an increase of 14% from pre-referendum). Also, 33% expect prices to rise sharply. The Financial Times presents in its Brexit follow-up a chart of the history of GfK’s Confidence Index from 2007 to 2016: The chart shows how CCB dropped from just below 0 to -40 during the 2007-2008 crisis, recovered to -20, declined again to around -30 during the ‘second-spell’ of the economic crisis in 2011-2013, and then climbed back to a little above 0 before the referendum. A decline of CCB actually already started earlier this year, and then came the steep single drop following the Brexit referendum. Consumer confidence was already at lower (net) levels and has experienced continuous descents in the past ten years; it may likewise continue to deteriorate below -20 again after the recent drop in CCB. A map by GfK shows variation across regions and demographic segments. Interestingly, the strongest ‘demoralising’ effect was found among the young group of ages 18-29 (decline of 13 points) compared with older groups (6-8 points off), yet the younger remain overall more positive and optimistic about the economy (index +6), especially compared with those of 50-64 of age (index -21). 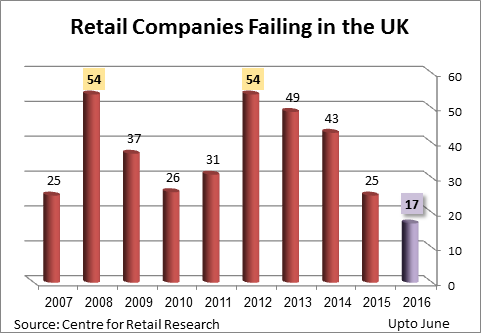 After three years of decline in the number of retail companies in the UK running into financial difficulties, since the last peak of 2012 (54), it seems to be rising again in the first half of 2016, according to data gathered and reviewed by the Centre for Retail Research (note that not all companies going into legal administration necessarily go bankrupt and cease to operate). Growing pressure on retailers during the process of leaving the EU may put even more medium and large retailers (in number and size of stores) at risk of failure. The depriciation of the British pound is expected to facilitate selling and increase exports to foreign consumers in other countries through e-commerce (i.e., retailing or shopping websites) by retailers residing in the UK. Especially during the period that existing trade agreements are still valid, it would be the best time for British retailers operating online to fill their coffers with cash. They will need to refrain from updating pound-nominated prices upwards as long as possible. When new trade agreements are reached, the terms for purchasing abroad online from British retailers may also change and new adjustments will be required. Ido Ariel of Econsultancy recommends three supporting marketing methods for encouraging international customers to purchase online at the interim period on UK retail websites: inducing a sense of urgency and initiating pro-active targeted prompting messages; offering targeted promotions to increase personalization (e.g., geo-targeting); and enacting limited-time discounts. However, the condition in which the British Economy arrives to this historic junction is concerning, having reduced its manufacturing sector too much over the years and relying too heavily on a services economy. This situation may mitigate the country’s ability to exploit its currency advantage in the short- to medium-term by increasing exports of goods, and may also put it in a less advantageous position as a strong producing economy in negotiations for future trade deals. The condition of the British economy could become even weaker if, as projected by the Economist Intelligence Unit, service companies — financial and banking of most — will lose their “passport” to act from the UK in the other EU member-countries (e.g., France, Germany), and thus they will choose to cut their operations in the country or leave altogether. The growth of the sub-sector of business and financial services is most noticeable, expanding from 13% in 1978, through 22% in 1990, and reaching 32% in 2013. A World Bank comparison referring specifically to manufacturing shows that its contribution to output in Britain is 10% versus 22% in Germany (UK’s is the lowest [with France] and Germany’s the highest among all G7 countries, 2012). In the long-term Britain may well succeed in re-establishing a strong position in business and trade. But it will come at a high cost in the short- and medium-term (next three to five years) for the economy overall, businesses and consumers, and this process is not free of risks. Is it that much necessary? Another contentious question is: How much has the EU really held the UK back? Answers to these questions remain in deep dispute. Having stayed in the EU, the UK might have been able to help stabilise the European economy while resolving its existing failures, and then grow faster with the EU. But too many Britons stopped believing this will ever be possible, or simply lost their patience. The EU leadership in Brussels bears much responsibility for arriving to this predicament. But that matters little now. It is now a time for taking an opportunity to resolve weaknesses in the British economy — industry and trade. It will have to prove itself as an independent viable economy, less reliant directly on the EU but more like many other countries trading with the EU. Retailers may have to make changes to their mixtures between imported and locally manufactured products; to form trading ties with different and additional countries; and more vigorously refresh and update their trading, merchandising and pricing techniques and tactics to be competitive on the local stage, and where relevant on an international stage. The Centre for Retail Research has expressed most pointedly what is expected of retailers: “Retail post-Brexit will have to be more agile, more digital, capital-intensive and more responsive to change”. Retailers and consumers will have to adjust to new market conditions and adapt to new game rules.